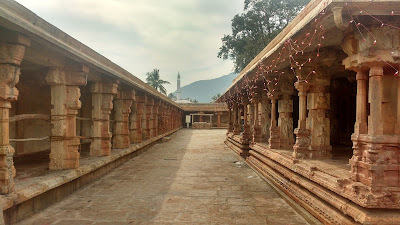 The village of Nandi at the foot of the Nandi Hills, about 60kms to the north of Bengaluru, is home to the beautiful temple of Bhoga Nandeeshwara. 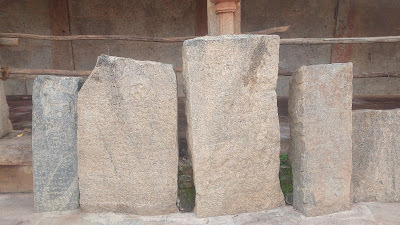 The temple, dating back to the 9th century, features elements related to the Dravidian, Hoysala and Vijayanagara schools of architecture. The temple is a fantastic example of the cumulative harmony of culture - each of the elements is distinct and yet is integral to the entire monument without over-riding any other element. This would be in direct contrast to monuments (especially those related to the Sultanates and Mughals) where older monuments were destroyed and their components used to create a new one. 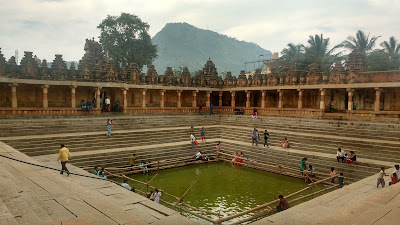 The Bhoga Nandeeshwara Temple complex can be divided into four sections: the outer enclave, the temples, the halls and the tank. 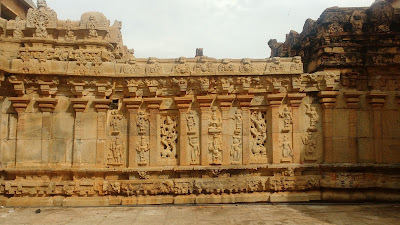 All sections other than the main temple bear a prominent Vijayanagara badge and are the more recent (about 16th century) additions to the complex. The Nandi Hills offer a picturesque backdrop to the temple. The outer enclave occupies the eastern three-quarters of the complex. 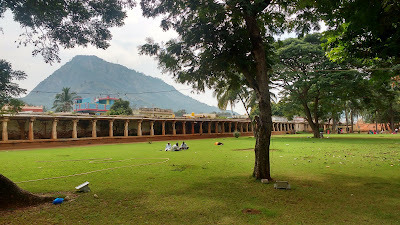 The enclave has well-kept lawns on either side of a central walkway, enclosed by a Vijayanagara style cloisters. This section also has small, open shrines for minor deities and a small stepped tank. By all appearances, his section would be equivalent to a temple Dharamshala. The enclave has three gates on each of the three walls. The northern and eastern gates are the most used, with the eastern gate functioning as the main entrance to the temple complex. 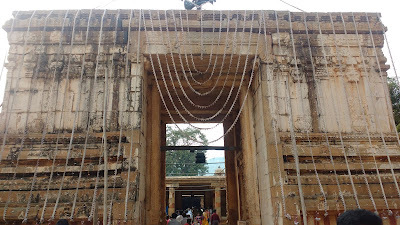 The western side of this enclace has the entrance to the temple section, enclosed by a big but simple gopuram (entrance tower). Next to the tower on the southern side is a small Darbar (council) Hall. The temple chariot stands in front of this hall. 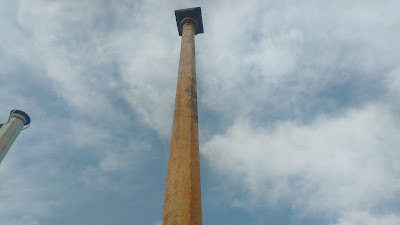 The Mahanavami Dibba (a raised platform for the throne, used during Dasara processions) lies to the north of the tower. This section to the south-west of the complex has a total of six temples. 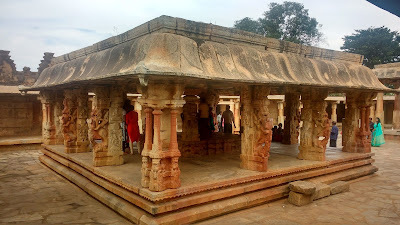 The centre of this section is occupied by the triple-temple dedicated to Arunachaleshwara, Uma-Maheshwara and Bhoga Nandeeshwara (ordered south-north). 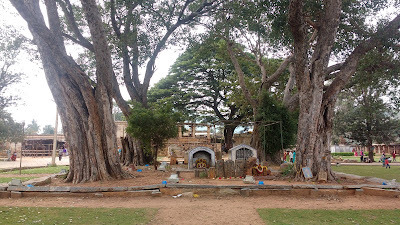 A temple dedicated to Girijamba (Parvati) occpies the north-western corner, while a small Kamateshwara shrine occupies the south-west corner. The western wall has the Apita Kuchamba temple. 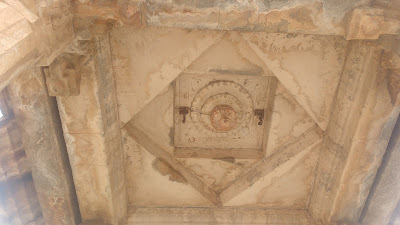 The south-east corner has a set of three inscriptions related to the history and construction of the temple. 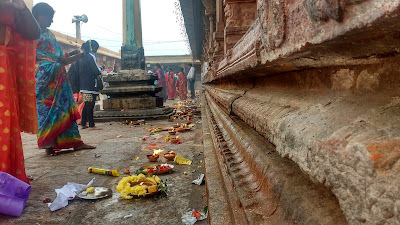 The construction of the Arunachaleshwara Temple is attributed to the Ganga dynasty while that of the Bhoga Nandeeshwara Temple is attributed to the Cholas. Both the temples have a Dravidian pyramidal spire over the garbhagriha (sanctum) and a spacious hall facing it. 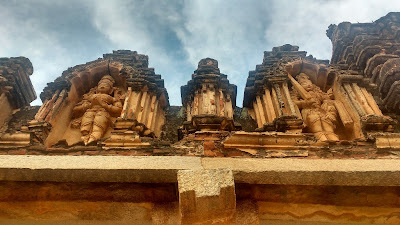 Both temples have their Nandis facing the sanctum. 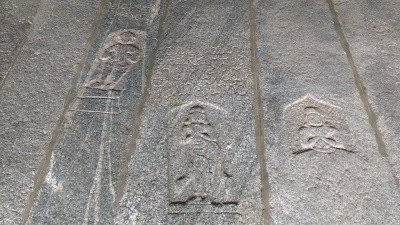 The southern wall of the Arunachaleshwara Temple depicts Shiva in a dancing pose. 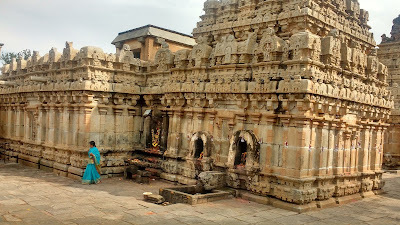 The northern wall of the Bhoga Nandeeshwara Temple has three minor shrines. The Arunachaleshwara Temple represents Shiva in his infancy while the Bhoga Nandeeshwara Temple represents Shiva in his youth. The temple of Uma-Maheshwara represents Shiva-Parvati and is sandwiched between the Arunachaleshwara and Bhoga Nandeeshwara Temples. This temple comprises of a simple garbhagriha (sanctum) without any other halls. 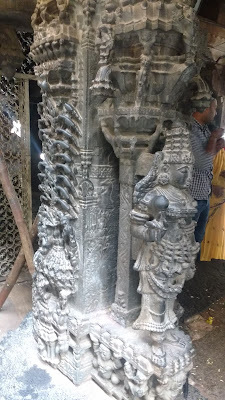 The santum however faces a highly ornate Vasantha Mandapa (open hall) that belongs to the Hoysala style. 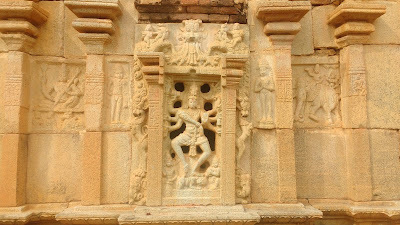 The rear wall of this temple is ornate, in contrast to the ones of the temples next to it. 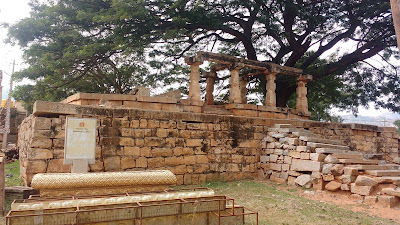 The three temples are united by a common sabha mandapa (outer hall) that is likely a late Vijayanagara addition. 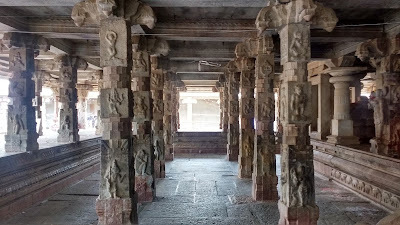 The section to the north of the temple section has Vijayanagara style cloisters on all four sides and two open halls in the middle open square. 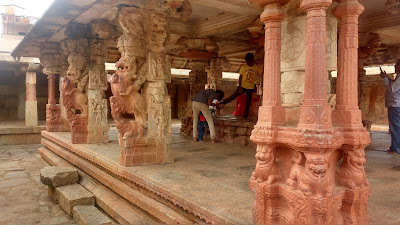 The hall to the east is called the Tulabhara Mandapa - which was probably used to support scales during festivities. 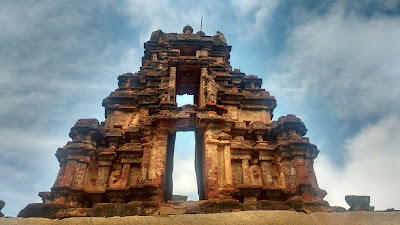 The one to the west is called the Vasantha Mandapa. This is more like a hall for performances. 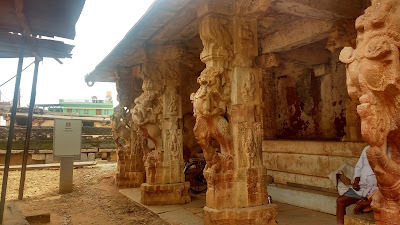 The pillars of this hall feature the Vijayanagara Yali-cavalry motif. 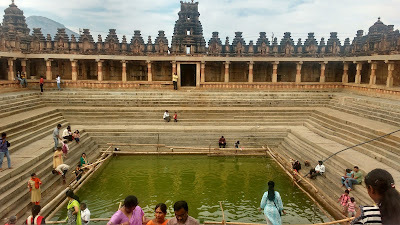 The northern-most section is occupied by a large pushkarni (stepped tank) called the Shringi Teertha. 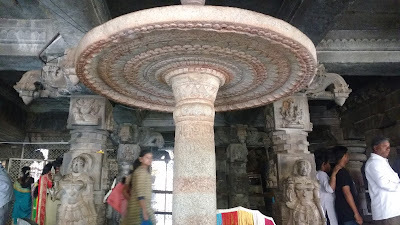 This beautiful tank is another Vijayanagara addition. The water in the tank holds fishes which presents a quick fish-pedicure opportunity. The tank is surrounded by cloisters on all four sides. The roof of the cloisters have beautiful figures in their niches. Looking at the tank from the north-eastern corner, one can see the majestic backdrop of the Nandi Hills. 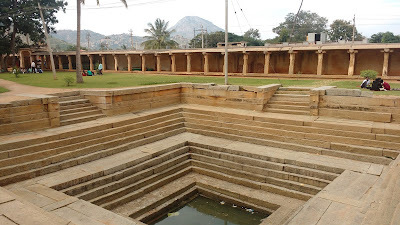 The tank is believed to be the source of the Dakshin Pinakini (a.k.a. Pennar) river and hence is also known as Pinakini Kote. 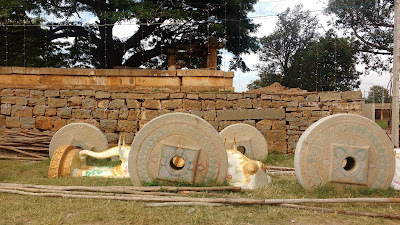 The most convenient approach for the Nandi village is from Bengaluru, 60kms to the south. There's no direct public transport from Bengaluru though. One has to take a bus to Chikkaballapur and then catch another one headed towards Doddaballapur to alight at Nandi. The local rickshaws for Nandi leave from next to the Government Junior College. The bus to-from Bengaluru and Nandi halts here as well and hence this is convenient interchange point. 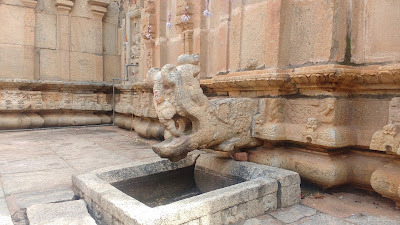 The Nandi temple is a convenient stop after a casual trip to the Nandi hills. Just ask around for the Nandi Devasthana.